1. The bass->amp cable had an intermittent short in one end caused by a strand of the shield coming into contact with the signal conductor. I've seen this failure mode many times in guitar cables. The constant motion and bending causes the shield wires to fray and migrate around inside the connector. The fix was to cut off the stray strands, and wrap some tape around the center conductor in the connector. 2. 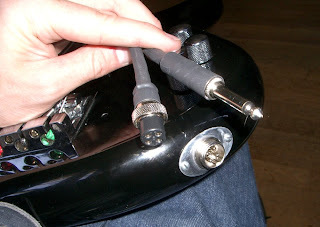 The 1/4" phone jack in the bass guitar itself would fail if the plug was pushed in just the right direction. 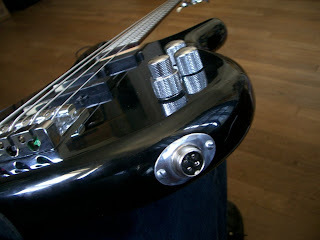 This bass uses active pickups and senses when the ring of the phone jack is connected to the sleeve (ie a mono plug is inserted into the jack) to supply power to the active pickups. This way, the bass will not run down the battery when it's not plugged into the amp. I am not sure which contact was failing intermittently, but it was probably the sleeve or ring. I replaced the phone jack with a 4-pin "mobile radio" connector. These connectors are very rugged and have a threaded ring to secure the plug into the socket. No amount of twisting or pushing will cause it to break contact. I used three of the pins (two are shorted inside the plug to provide the battery-saving feature). I made a special cable that converts the 4-pin connector on the guitar to a standard 1/4" phone jack on the amp. The only downside to this setup is that the plug cannot rotate, which is one benefit of the 1/4" phone jack -- it helps to get kinks and twists out of the cable while walking around or moving the bass around stage. Anyway, I'll post about this again if it turns out to be a really bad or really great idea. Aahhh, that's so much better. 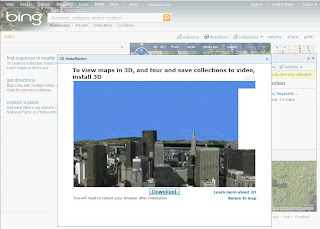 It actually looks like a map now, and I don't have to spend at least three clicks closing stupid windows everytime that I see a Bing link somewhere on the 'Net. In this post, I will describe the setup that I use to record my drums while practicing. I recently bought a Zoom H4 Handy Recorder. 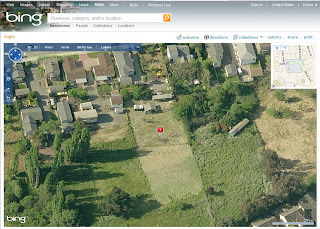 It works really well, and I think it is a worthwhile piece of equipment. One of its really nice features is the ability to connect two external sound sources and also supply phantom power. The device allows individual level adjustment for each source, and will also mix the two inputs into stereo. I have it setup with a Tama Rhythm Watch RW105 metronome, and an omni condenser microphone. The mic is normally used for testing the frequency response of home theaters and it has an extremely flat response from 20Hz to 20kHz. This doesn't necessarily make it a great overhead mic for drums, but it's what I have. The output of the H4 goes into earbuds, then I wear large earmuff-style hearing protectors over the buds. 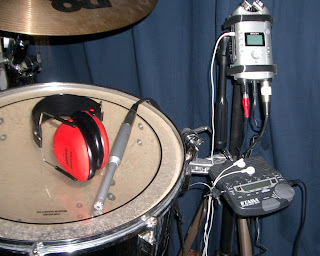 This lets me adjust the volume of the metronome and drum kit (from the single condenser mic) very easily. I can also hit record on the H4, and make a quick track so that I can critique my playing very quickly. This setup has proven very useful.